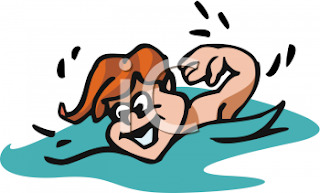 Our complex/subdivision swimming pool was closed on Monday as well as today(Tuesday). I work as the attendant at this pool part time so I hobbled my way down to workout/ride exercise bike before work yesterday afternoon and noticed a sign on pool gate door stating closed for cleaning. Now I know that the great maintenance crew usually cleans and chemically "shocks" the pool early on Monday mornings with the pool ready for use by 2 or 3 in the afternoon. I entered the office to inquire "What's up with the pool". The reply, "Well the "guys" can't get the pool water to the right chemical levels and it looks horrible!" The generally accepted reason was the fact that we held our 1st summer pool party on Saturday. Mind you, we have a pool party every year and I don't recall any extended closing of the pool following these in past summers. My thoughts differ slightly in that not only was the pool party Saturday in 100 + heat index weather but also the fact that I've noticed numerous single fathers living here whom I'm sure had visitation rights on Sunday as it was Fathers Day. Hmmm... lotsa extra little kids in the pool on Sunday added to the masses "bakin' n' bathin"and eating and drinking free beer, cocktails and more on Saturday ..
A quick analysis of these mitigating factors and Presto we've got screwed up pool water.. Coincidence..? I think not. Fathers Day + Pool Party = Yucky Green Pool Water..
Scheduling Conflict maybe ..Big sign stating "No P in our Pool" okay..Responsible parenting..yeah it'd help. Remember anyone can be a Father ..Being a Dad is a COMMITMENT.!! Happy Belated "Dads" Day to All who qualify.!!! After dropping 2 of 3 in the Bronx over the weekend the Mets (39-30, 24-10 at Citi, 2-1/2 GB Atlanta) return to action tonight hosting the AL Central 2nd place Detroit Tigers (38-30, 13-19 Road) after Monday's scheduled day off. Jerry Manuel will give the ball to one of his most consistent starters in recent weeks, Jonathan Niese (4-2, 3.64) to face Justin Verlander (8-4, 3.54) in the opener of the 3 game series. The Tigers bring a potent attack to this inter-league series with Miguel Cabrera (No Beer for Me) leading the parade with his MLB leading 19 HR and 60 RBI and a .328 avg. The Great Wall of Flushing is well within his reach "Lookout LF Landing!!" Former Yankee super prospect CF Austin Jackson is expected to return (after missing the last 6 games with back spasms) to the top of the Tigers order which also includes a resurgent Magglio Ordonez 9/47/.333 a "happy" Carlos Guillen playing 2B ( his 3rd position switch in 4 years) surprising rookie Brennan Boesch 10/36/.336 and of course Former Yank Johnny Damon. The Mets will look for continued production and exuberance from Jose Reys, Davis "Ducky Wright and Angel Pagan while hoping for the ongoing emergence and effectiveness of starters Niese, RA Dickey and Hisanora Takahashi. Nice easy saves from K-Rod would be a big boon to Mets' fans heart rates and cuticle munching problems. Both clubs sport 9-3 inter-league records thus far in 2010. Pool's Closed, I'll be in the "Room" for Mets Chat at about 7PM eastern.. Lets Go Mets !!! & don't forget All Star voting for David "Ducky" Wright and write in Angel Pagan to "Send An Angel to Anaheim" ends in 9 days. Click Icon Top right to vote now.